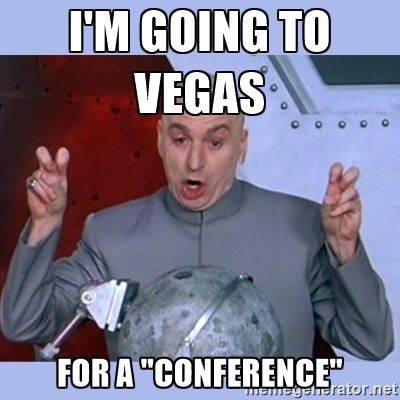 Hang on a second while I count the number of awesome teaching conferences I have attended in Sin City. Oh right, that'd be none. While it would seem that well-educated professionals in other lines of work can travel more easily to such "conferences" à la all-expenses-paid support from their employers, teachers aren't often presented with such favorable circumstances. However, I would argue that, as a whole, we have a greater need for recharge and opportunities for productive discourse than any other occupation. After swapping a few email addresses and making new Facebook friends, you'll have a support network to summon when you need a lesson idea or a sounding board for working through issues. This is particularly valuable when you teach a specialized subject (ESOL, Advanced Placement, band, etc. ), and you are the only one in your field at your school. Unlike one-size-fits-all school and district-based programs which don't always align with personal preferences or your unique subject material, conferences allow you to select the sessions that are most relevant to you. Many of my best lessons were stolen in this manner- there's no shame in my game! I remember enjoying writing lesson plans in college when all my creative juices were flowing, and I didn't have piles of pesky paperwork to hinder my planning. One of the joys of teaching is that each year grants us a chance to change things up. Without taking the time to stop and examine the new practices that are available, we start to become like an old, stale box of crackers- we can still get the job done, but we're much less fresh and palatable for those who must consume our provisions. With so many lessons on the internet and from curriculum developers, it is refreshing to have a fellow teacher walk you through an activity, complete with tips and personal experience, so you can feel confident utilizing novel methods. As a conference presenter myself, it is invaluable to have session participants share their insights with me. The camaraderie is often palpable and always appreciated. Edcamps are participant-driven, vendor-free, "unconferences" where organizers set a schedule for the day, but participants decide the sessions on the day of the event. Interactions are via presentations as well as impromptu discussions. At these events "anyone with a good idea is encouraged to lead a conversation." Check out their multitude of upcoming events, and see if one is in your area. To me, your state's subject or level-specific conference should be your lifeblood. As a member of the Georgia Science Teachers Association, I have been kept up-to-date with trends in education for the last 11 years. Their awards and grants (due each November) not only helped me secure funding for my classroom, but they include registration to the conference along with some travel reimbursement. What a great investment of time to apply! Check your organization's offerings; you might be surprised at what is available in your backyard. These seminars are based on intriguing historical topics and are open to teachers of all subjects. As a plus, travel reimbursements are offered. The deadline for 2017 has passed. But, bookmark it for next year, and make sure your school is on the affiliate list before the 2018 cycle. Hosting institutions include Yale and Oxford College, and the topics are pretty intriguing, even for this science nerd. Hosted in weekly workshops throughout the summer, this was one of the best programs I have participated in as a teacher. While staying in a beautiful area surrounded by the Tetons, we studied conservation and ecology, made fishing flies, went whitewater rafting, and learned archery- all with my travel and tuition covered. If you need to get away, apply with a friend (I attended with two! ), and get back to nature this summer. Teacher Materials Camps are designed to introduce STEM teachers of all levels to the world of materials science. Last summer, I attended one in our nation's capital in order to learn more about about plastics, polymers, and alloys. We blew glass, made pottery, and performed various engineering challenges. I went home with tons of freebies and lesson ideas. Check out their full schedule of offerings here. Hach classroom and professional development grants are lucrative funding sources for conferences like NSTA or ChemEd. Last year, I was awarded two Hach grants: one I used for travel and the other I used for classroom models. The time required for the application process was well worth it compared to the funding I received, so I would highly recommend this program. Being an AP reader sounds like work, and it is, but you learn invaluable information to share with your students about how their exams are scored. There are nightly social and educational gatherings, and you won't have to wash a single dish all week. If you want to make a professional learning network with like-minded teachers, this is a great start. If nothing above is resonating, you can always peruse other online lists, and leave no local stones unturned; other ideas for financial support fellow educators shared included using departmental and booster club funds to cover conference costs and exchanging a volunteer shift for free conference registration. I know I have often felt as though there was no money in my district for attendance or travel expenses; nevertheless, I persisted by approaching my administration with a clear goal for my participation. Bonus points for your plea: offer to share what you learned with relevant groups when you return. If you have a lesson or technique you're excited about sharing, tell your leaders you want to submit a proposal for a conference session of your own in order to help support your request. What principal doesn't want their school to look good through showcasing its teachers? Even if you think your school will say no, ask anyway. You have nothing to lose! 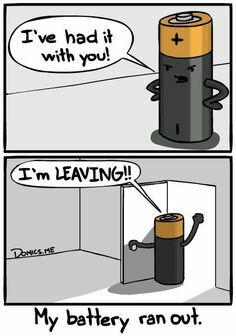 Should you already have your own recharging conference in the works, check out this solid preparation advice from Education World. As for keeping your phone battery charged while you're there, you're on your own. P.S. My list is in no way an exhaustive one, so please keep the commentary flowing. If you have any other PD tips to share with willing ears, leave your ideas in the comments below. I was just looking for a summer trip. Going to bookmark this for next year. Nice list! Conference seems like a nice idea. It will be great.